TITAN provides devastating disruptive effect with long pimples and Anti-Spin rubbers. 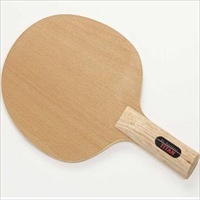 Despite the use of balsa wood the speed on the backhand side has been extremely reduced. Nevertheless the ball can be accelerated quite effectively through aggressive pushing, lifting and counter-attacking. On the other side the ball can be accelerated very forcefully. The blade offers dynamic attacking possibilities both with pips-out rubbers (counter-attacking, hitting) and with inverted rubbers for a powerful topspin game with a lot of spin. Another decisive characteristic of this blade manufactured by Re-Impact is its astounding control. The excellent feeling for the ball has been yet again improved. The faster side is the one with the black "Dr.Neubauer TITAN" label in the handle. The slower side is the one without the black "Dr.Neubauer TITAN" label in the handle.